You are currently browsing the tag archive for the ‘watch read listen to this’ tag. 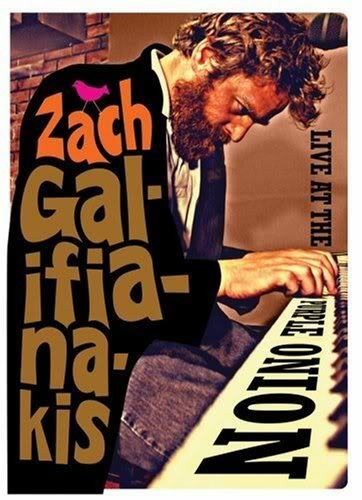 What with all the (deserved) attention Zach (one of my favorite stand-up comedians) has been getting lately due to the success of his film The Hangover, I decided to pop in my “Live at the Purple Onion.” It’s still as funny as it was the first time. Zach drunkenly plays piano and shoots one-liners at the crowd (“Have you seen this show on Lifetime about that woman?” “When you look like me, it’s hard to get a table for one at Chuck E. Cheese”). It’s fun, it’s silly, and it’s smart. Seriously. It’s all of those things. I think I got my copy from Half.com, but I’m sure one could find it on Amazon.com and the like. Though I’m not too far into this book, it’s like a novelization of The Office, if The Office was directed by the Coen Brothers. It’s a darkly funny take on officelife. For example, when their co-worker’s daughter goes missing (she turns up strangled in a parking lot – told you it was dark), these advertising firm employees put together flyers with the girl’s picture on them, making sure to thoroughly PhotoShop the little girl’s picture, and to make the word, “Reward” really stand out. It also manages to feel extremely relevant and timely, as much of it centers around employees getting laid off, and the remaining workers wondering who’s next. I wouldn’t call it a page-turner, per se, but it is strangely addictive. It was the birth of the rock musical. The songs, which are about drugs, open-mindedness, racial acceptance, war, the environment, and free love, feel just as relevant now as they were meant to be in the 60s and 70s. It’s amazing to me that this show was as popular as it was back in the day, let alone that it even made it to Broadway. Highlights have to be “Donna,” “Flesh Failures,” “Walking in Space,” “Easy to Be Hard,” “Hair,” “Air,” “Electric Blues,” and “Good Morning Starshine.” A boisterous cast (their energy comes across even though it’s only their voices doing the performing) with some outstanding voices make this album really worth it. Pick it up or at least download a few of the songs, and let the sunshine in. Yeah, I said it. Recently, I watched British director Mike Leigh’s two most recent films, Happy-Go-Lucky and Vera Drake. I was impressed by both. While they are intensely different (the first is a modern quasi-comedy, the second a period drama), they also share some shocking similarities. Both portray very giving, optimistic, and overall cheerful women who are faced with people and situations that – at least temporarily – destroy their happiness. For Poppy, the Happy-Go-Lucky school teacher, it comes in the form of a cranky, pessimistic driving instructor, a man who is her polar opposite. For Vera Drake, her happy family life comes crashing down when a terrible secret of hers gets out. Both films are more character-driven than plot-heavy, and Leigh really proves that he “gets” female characters. They also focus more on lower-class England, and its inhabitants. This is particularly striking, as many modern-day comedies portray people who live an inexplicably comfortable life (i.e. rom-coms that always give their heroine a wonderful New York apartment regardless of the fact that she’s an entry-level assistant or some rot). Many period dramas focus on the petty struggles and hedonistic relationships of the upper class. The wonderful thing about these two films is that they refuse to stick to these norms, and thereby become something that a viewer, whether they be British or not, can relate to. I feel a bit fake putting this in here, as I’ve only read past the hundredth page, but I’m already captivated by it. It uses the story of two brothers, both Fundamentalist Latter-Day Saints (the cultish, splinter groups that advocate polygamy), who commit a violent and senseless murder of their sister-in-law and niece, as framework for a larger story. In trying to detail the murder and their reasoning behind it, Krakauer explores the history of Mormonism, details life in a Fundamentalist compound, and populates his tales with intriguing characters, many of whom have escaped the compounds and left the “faith.” While he makes his standpoint on Fundamentalists and their practice of marrying off young teenage girls to very old men very clear, he remains non-judgmental on Mormonism as a faith, allowing the reader to form their own opinions on the matter. It doesn’t read like textbook nonfiction, but it is extremely informative and, dare I say, a page-turner. Maria Bamford is quickly becoming one of my favorite stand-up comedians. She’s a female comedian who openly mocks the routines of your “typical female comedians.” She’s at her finest when she’s doing her many voices – her father, her mother, Alicia Keys, an overly confident date – and she definitely has a new and humorous viewpoint on the world. It’s a quick and exhilarating, hysterical listen. If you can’t afford the album, I’d just recommend her comedy in general. She’s got some great videos up on YouTube. Here’s a great one where she impersonates and talks in detail about her aging pug, Blossom. This will probably be a thing I’ll do often, as my tastes revolve constantly, like a carousel. I’m working on my figurative language skills, give me a break. -The fact that both “Gossip Girl” and “The Office” have been in re-runs lately.